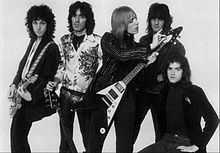 Tom Petty and the Heartbreakers en 1977. Shelter, Backstreet, MCA, Warner Bros.
Tom Petty and the Heartbreakers est un groupe de rock américain. 1978 : You're Gonna Get It! 1996 : Songs and Music from "She's the One"
1985 : Pack Up the Plantation: Live! Ce document provient de « https://fr.wikipedia.org/w/index.php?title=Tom_Petty_and_the_Heartbreakers&oldid=154816250 ».